Kiwis are an excellent addition to your green smoothie. Their mild flavor won’t overpower your smoothie but will provide a little tropical flair. Kiwis also possess their own unique set of health benefits. Kiwis are very rich in vitamin C, containing more of this essential vitamin than an equivalent amount of orange. They are also a good source of dietary fiber and potassium and contain trace amounts of other vitamins and minerals. In large part due to their high vitamin C content, kiwis offer tremendous antioxidant protection. Phytonutrient (plant nutrient) research has demonstrated their ability to protect DNA from free radical damage. A diet high in soluble fiber is great for the health of your colon (helps remove toxins from the colon), reducing high cholesterol levels, and keeping blood sugar levels under control. I generally like to peel off the thin layer of skin from kiwis before eating or using in a smoothie. Optionally, you can rub the fuzz off and eat the skin for added nutrients and fiber. It’s up to you. Now, for the kiwi banana green smoothie recipe. 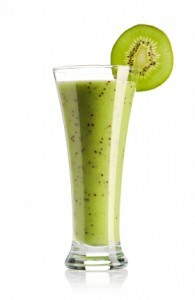 Please leave a comment below if you try this kiwi banana smoothie recipe. Happy Blending!